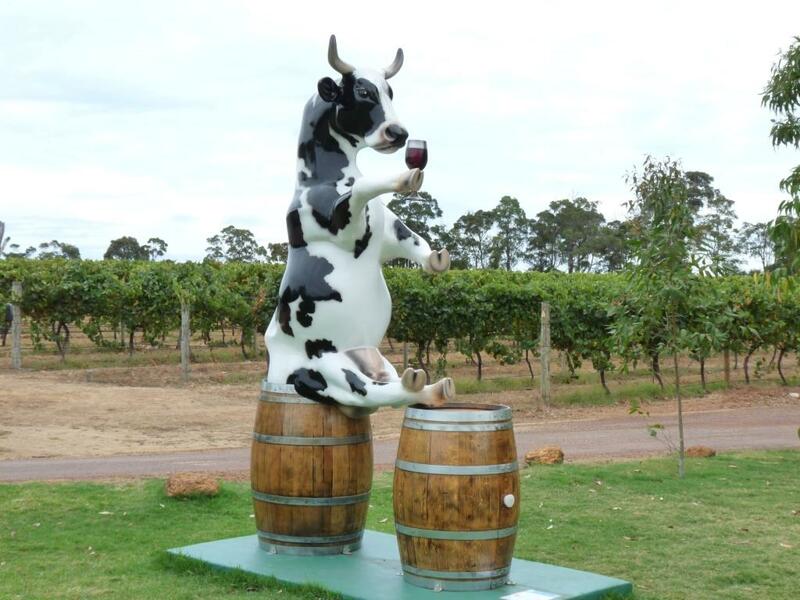 Over the hills and far away, down in the Margaret River region, the cows are out to play. Yes, you too can be entertained as I was, ‘Till the Cows Come Home’ by lifesize Moo-art, featuring among others, Miss Beau Vine, The Cow of Many Colours, Brahman the Barman, Jacques Cowsteau, Herd it on the Grapevine, and Herd But Not Seen – in all 85 different creations at a wide variety of host venues between Augusta and Busselton. Pharmoosist. Artist: Michael & Penny Wise. Location: Chemmart Margaret River. 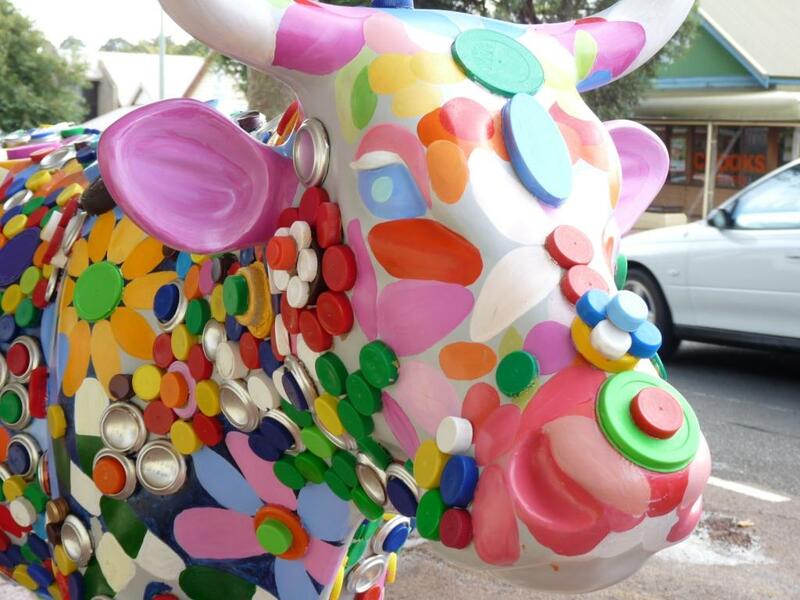 The design of Pharm-moocy cow depicts good health and happiness using recycled plastics resembling pills and capsules. What are they? Three dimensional canvases, transformed into works of art. Over 2500 cows have been created for CowParades all over the world, and although the cow canvases remain the same (they’re molds … standing, grazing or upright), the artists put their own individual stamp to each cow, so they all look very different. But why Cows? 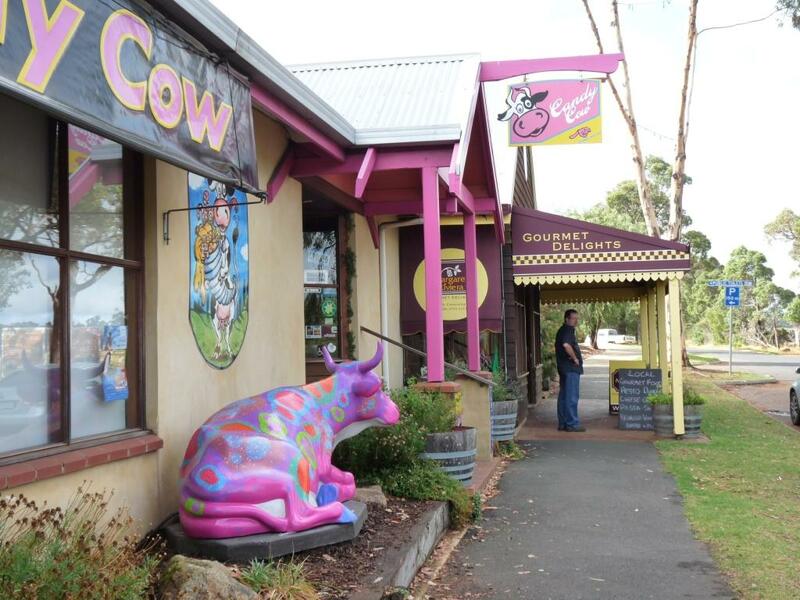 Because it’s said that cows are universally loved and they ‘cut across social and cultural boundaries’ according to the Event Programme, $9 from local visitors’ centres (there’s also a free map available). Cows are also a neat fit for the South West region because you can see them grazing everywhere, and the beef and dairy industries are an essential part of the area’s lifeblood. 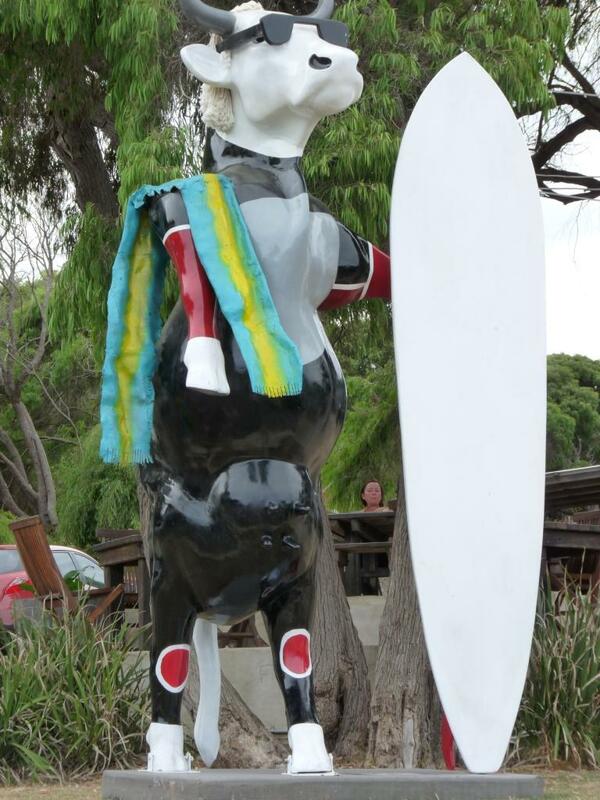 I didn’t know that Cowaramup is known as Cowtown or that a surf break has been named Cow Bombie by local surfies. Cow Bombie. Artist: Ryan Tate. Location: Sea Gardens. So don’t let it be said that ‘The Grass is Always Greener,’ on the other side of the fence. 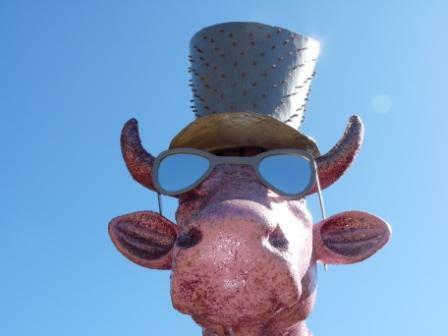 Hop on down to Margs and see what’s mooo’vin and groovin in this artistic mecca until June 2010. Below are a few more of the arty bovines we encountered. I’m hooked though, next weekend I’m going back to seek out more. Maggie May. Artist: Community with artwork by Patricia Negus. Location: Moon Haven, Cowaramup. 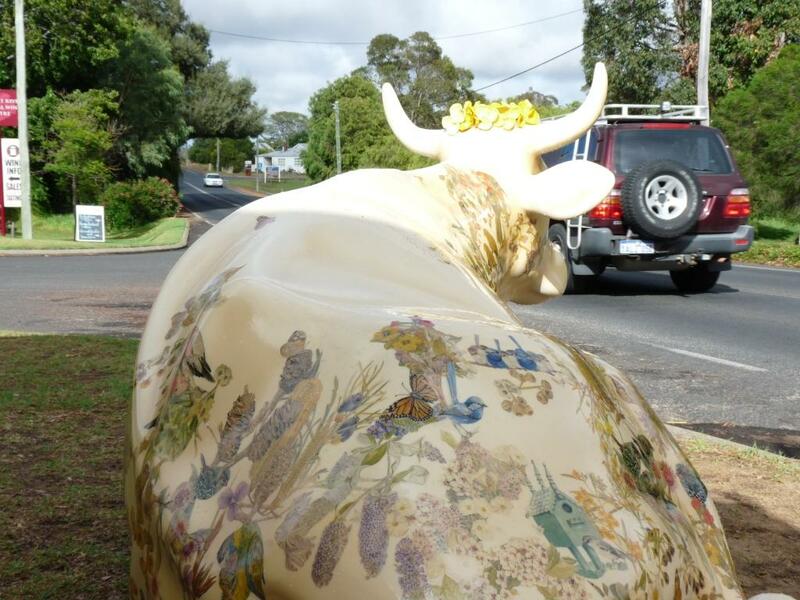 Decorated with the Flora, Fauna and Fungi of the Margaret River Region. 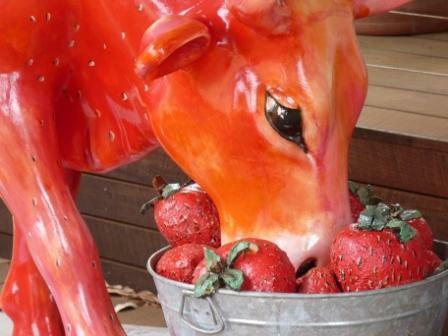 So if you’re in the region, grab a map and get moo-ving. If you’ve got a favourite, drop a note in the Comment box. Even better you could re live your trip? It was a swell parade 🙂 And yes, it’s still fun spotting the cows in different places around the SW and Margaret River. Well done on being part of something so great. The Lutherean one was Fab!